New Wolverine movie image released! Related: apparently I liked the first one. BleedingCool posted an image from the upcoming “The Wolverine” movie, which, if I remember right, is based on the Chris Claremont / Frank Miller miniseries that was set in Japan. It probably involved samurai and ninjas, but honestly I don’t remember all that much about it even though 1) I remember reading my cousin’s copy of the miniseries issues as a kid because I loved that awesome claws-exposed Frank Miller cover and 2) I own the paperback and 3) I’m quite convinced I liked it. However, I’ve reacted to news about this movie — and even this badass image linked above — with a general “Eh” attitude, and I am pretty sure it’s because I have decided over time that I hated the first Wolverine movie and considered it on the same level as X-Men 3. But then I went back and read our review of the movie and it turns out I actually liked it! I haven’t seen it since I watched it in the theater, and over time I’ve apparently confused my expectations of the movie with my reaction to it. So now I’m kind of excited again! It has Wolverine, and I bet the odds are good that it has ninjas! So I think at some point I’d like to sit down and watch the X-Men movies in the proper order — X-Men First Class, Wolverine 1, X-Men and X2. That should be a decent day. Also, you should read that review because it’s pretty great. Doom DeLuise and Jim Doom mentioned in their podcast a few weeks ago that they had not read All-Star Western from the New 52. Well I have read every issue to date, so I feel I have an obligation to tell you folks how it is. So here goes nothin’. I’ll start off by explaining the basic premise and format. All-Star Western is, as the name would suggest, a comic set in the Old West. 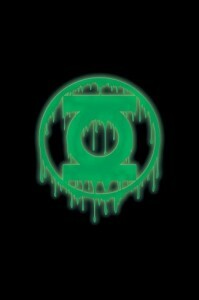 Each issue has a “main” story arc and a much smaller “mini-comic” whose arc usually spans 2 issues. The main story arc follows Jonah Hex. Some of you may be familiar with him (I wasn’t) as he used to have his own series. The premise for Jonah Hex is a bit different this time around. This time, Jonah teams up (albeit very unwillingly) with Dr. Arkham– whose name is engraved on Arkham asylum in present day Gotham. 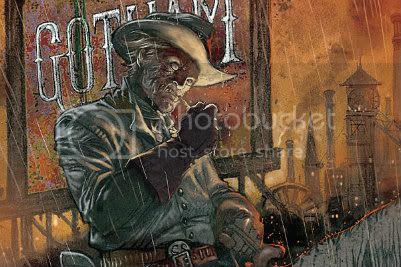 As you may have guessed by this point then, the comic also takes place in Gotham City…..back in the Old West!! Bruce Wayne’s ancestor with some order of magnitudes of ‘great’ in front of it is there, as are several names you’d welcome from the powerful in Gotham today (e.g. Cobblepot!). The first year has a very long arc that starts with Jonah Hex (aka world’s greatest badass) teaming up with Dr. Arkham (aka C3PO) trying to solve a few minor crimes. As they start digging further in, however, they accidentally expose huge conspiracies, including the Talons (yes, it has a ‘Night of the Owls’ tie-in!) and followers of the ‘Crime Bible’ (which sounds like a second grader made it up). Eventually, Hex meets up with other old friends, and they work together to try and bring these criminals to some Texas Justice.